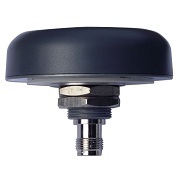 The TW3440/TW3442 from Tallysman Wireless are professional grade 40dB fixed mount Timing antennas covering the GPS L1, GLONASS L1 and SBAS (WAAS, EGNOS & MSAS) frequency bands (1574 to 1606 MHz). The TW3440/TW3442 GPS/GLONASS timing antennas are especially designed for mobile, precision and military applications and offer excellent circular polarized signal reception, multipath rejection and out of band signal rejection. The TW3440/TW3442 feature a highly circular dual-feed wideband patch element, with a three stage Low Noise Amplifier. This configuration provides excellent axial ratio that is constant across the full frequency band. An optional tight pre-filter is available with part number TW3442 to protect against saturation by high level sub- harmonics and L-Band signals. The TW3440/TW3442 is housed in a permanent mount industrial-grade weather-proof enclosure, and comes with a TNC Jack (female) connector. High gain LNA: 40 dB min. Low current: 21 mA typ.